Comments: Least Bitterns inhabit marshes with dense cattails, bulrushes, sedges and other aquatic vegetation. They feed primarily on insects and small fish and appear to be weak, clumsy fliers. Least Bitterns are found along the eastern portion of the Great Plains during the breeding season. They are territorial and often answer to recordings of their calls. Nests are made along channels through vegetation in wetlands. Because this waterbird is so secretive, much remains to be learned about its wintering and breeding ecology and population status. Least Bitterns are approximately half the size of American Bitterns and the dark back, cap and dark and buff-colored wings are distinctive. 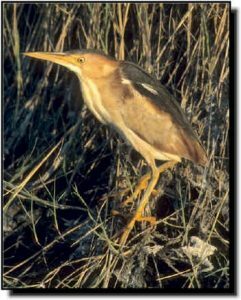 A rare, darker color morph, the Cory’s Least Bittern, has been reported from the eastern Great Plains. Least Bitterns are larger than most of the rails. Immature Green Herons are slightly larger with dark wings.